Wow! While I was gone to quilt camp, the number of 52 Quilts followers jumped to more than 500! This calls for a major giveaway -- but first, WIP Wednesday. Can you believe there are only 30 days left of Spring? We haven't even HAD Spring yet in Colorado -- my furnace still kicks on every morning! My second WIP this Wednesday is the Fat Quarter Shop's 2012 Designer Mystery BOM. I absolutely love the fabric, Vintage Modern by Bonnie and Camille. 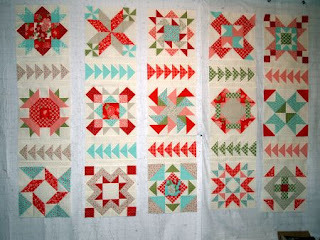 In fact, I love it so much I added three blocks to make the quilt 15 blocks rather than 12! "Weather Vane" by Barbara Groves and Mary Jacobson; "April Showers" by Sweetwater; "Lakeside Retreat by Joanna Figueroa, "County Fair" by Julie Comstock; and "Mint Julep" by Lisa Bongean. "Mexacali Rose" by Marti Michell; "Cherry Sundae" by Barb Adams and Alma Allen; "Five Geese Flying" "by Marti Michell; "Signed Sealed Delivered" by Amy Burg Gibson; "Lime Sherbet" by Bonnie Olaveson and Camille Roskelley. "Laundry Days" by Anne Sutton; "Moonlight Serenate" by Sandy Gervais; "Breezy Afternoon" by Aneela Hoey; "Sunday Drive" by Polly Minick and Laurie Simpson; and "Town Square" by Kate Spain. While searching for the names of the blocks, I found more made with the Vintage Modern fabrics. I may make this quilt 20-block size! 52 Quilts has had a bump up in followers thanks to a post by Free Quilt Patterns and a link on Quiltville's Facebook page. This calls for a "Big Giveaway!" And what could be bigger than a stack of 24 fat quarters? I love this collection, "Spirit" by Lila Tueller for Moda. Plus, both the "M" and "S" sets of Marti Michell's templates. I'd love to know how you found 52 Quilts in 52 weeks. Please comment below and tell me. 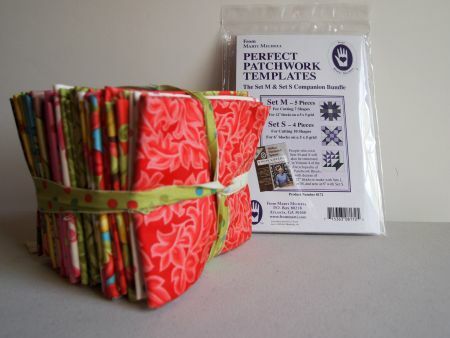 Since this is a celebration of 52 Quilts followers, to enter the giveaway you must be a follower! Of course, international entries are welcome. If you're a no-reply commenter, be sure to leave contact information in your comment. Giveaway will end Thursday, May 30 at noon MDT. I have some great finishes to show you on Friday! C'mon back! I have been following you for a while now. I think I found you from a link party but I am not sure. I love all your projects and love watching the quilts progress. Congratulations on crossing the 500 mark, WOW!! What a wonderful giveaway and thank you for having it. I don't know for sure how I first found your blog -- probably from another blog. But in the many months I've been following I know I have found some great inspiration. Congrats on your follower milestone and thanks for the chance to win that big, beautiful stack of fabrics! I've been a follower for a few months at least and I don't remember how I came across the blog originally. I follow you on bloglovin. And I have no idea how I came across your blog, probably a link on someone's side bar? Anyway, I obviously love it, so I keep coming back! Thank you for the chance to win this great bundle! I stared quilting at the beginning of last year and I was on a hunt to find any blogs that could help.. I found yours and you were doing the quilt tops every week and I thought that was awesome and I looked forward to seeing waht you had to show so I started following. I follow on Google Reader (sniff that it's going away. Need to find a new reader.) I've only been following in the last 6 months, and I don't remember! Must have been Quilter's Newsletter, Fat Quarter Shop or another blogger. Maybe even Bonnie Hunter a while back. I just like your style, so I stayed. Thanks! 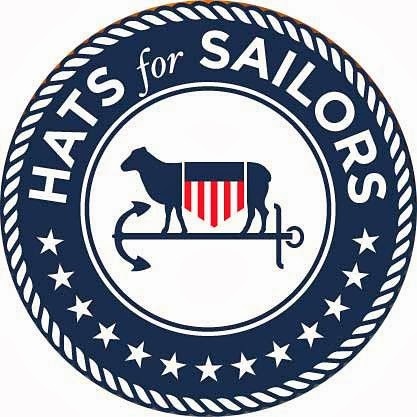 Just discovered this site on Free Patterns (internet link). The binding technique will certainly speed up my donation quilts for the hospital. Thanks for sharing. I started following you sometime last fall... can't remember the exact how or why but I enjoy seeing all of your beautiful projects and enjoy the UFO Finish motivation too! I can't remember how I started following you, but I know that I come back for the inspiration. I love that quilt. I'm glad you made it larger than the twelve blocks. I am follower and started following as part of a linkup party...just don't remember which one. I don't really remember how I found your blog, but I'm going to guess it was via a giveaway (back when there was that blog where folks could advertise giveaways). That's how I found a LOT of the blogs I still follow. I follow you on Google Reader,and I love your blog! I found you through another blog, and I've been following you for a long time! Thanks for the giveaway and YOO HOO on 500 followers! I found you through Pink Pincushion blog. I'm a fairly new follower of your blog. I love seeing what others are doing. Many congratulations on getting 500 followers! I've been following you for a while - I think I found you through another blog but I can't remember which one! Gratz on your extra visitors! I have have been following for so long I don't remember how I stumbled across your blog, probably a web search about quilting or link through another blog. I love seeing your projects so I'll keep "checkin" in with you. I love LOVE your blog. I found you from a quilt finish site and have been following you just FOREVER. You are amazing how quickly you can make a quilt!! 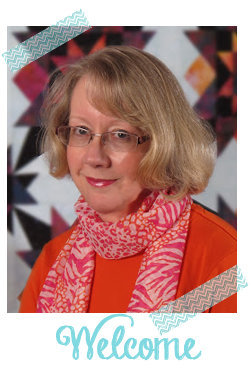 I was surfing looking for quilt ideas and stumbled upon your blog. I think it might have been a link off of someone else's blog but I don't remember who. I was in an info gathering mode and just looking for sites that I liked. I follow you with bloglovin, which is now my night time read!!!! To be honest, I don't remember how I found your blog! Maybe a link from another blog? I am a follower! Oh golly, I cannot honestly remember how I found your blog, Aunt Marti. I joined back when you had about 150 followers. Congrats on your growth and thank you for sharing. I enjoy your tips and seeing what you are working on. I cannot remember exactly how I became a follower... I think it must have been through a sewmamasew giveaway day perhaps? Anyhow, love all the quilting goodness I see in your blog and in all the others I follow out there. Really, the community is so nice, so much inspiration and general goodwill among quilters! Ohmigoodness, I just realized today is the 1-year anniversary of Susie's Magic Binding! Par-tay! I've been wanting to make a rainbow/color order quilt for a while now. Since the baby keeps me from sewing in long chunks, I think the idea of sewing a block a day would be good for me! I have been following for a while ... but cannot remember were exactly I came across the link that brought me here, sorry. I couldn't possibly remember how I began following your blog... probably a blog hop. But I won't forget how the name of your blog got my attention and curiosity!! This is an amazing giveaway - woweee! Learned of you when you went to the retreat at the monastery earlier this month. Would love to know how to become a "follower" so I can have a chance at the giveaway (I'm not very computer literate but if you tell me how, I'll give it a try). Great fun! Jodi, I've had to give up on my favorite blog reader, Google. So if you go to the right hand side of the blog, you will now see a link that reads "follow this blog with bloglovin." Click there and it will lead you to follow my blog! mmm. well I'm like a lot of the others - I don't remember how we first connected!! I did notice you on the Free Quilt Patterns the other day - I felt quite chuffed to realise I knew an Important Person!!! And I do love tht binding technique! About to use it on my May Finish..500 followers? amazing. I don't remember how I found your blog but I'm sure it was while recuperating from surgery on my foot. I could not sew so instead spent my days re adding crafty blogs. I've been following you on Google Reader for a long time and I don't remember how I found you. Now I follow you on Bloglovin and I just added myself to your followers. Thank you for the chance to win your fantastic giveaway. I started quilting less than a year ago and am addicted. I found your blog through other blogs that I found through googling. Hmm, don't remember exactly how I found your blog, but it was probably through one of the blog hops last year. Now I'm an avid follower. Congrats on the number of new followers. And, thanks for the giveaway. I have been following your blog for a long time now (now using bloglovin) so I am not sure but I think I found your blog on the sidebar of another blog. Sou seguidora a mais de um ano,te encontrei sapeando pela net através de outros blogs.Parabéns por tudo que tem feito,eu gosto do que vejo.Obrigada por abrir internacional,sou BRASILEIRA. I've been a follower for a while -- I think I found you through another blog. congrats on the landmark, and thanks for a chance to win. I've not been following for long, and officially it seems, only as of a minute or two ago when I checked and made sure I was. You've been a link on my own sidebar for awhile. I don't recall how I found you, probably a link on someone else's blog. I found your blog in Decembrr, 2012, and immediately decided to join your 13 in 2013 challenge. So far I was update to date through April, but May is not looking promising. I think my original link to you was through Pinterest. I have been following you for quite awhile and I am not sure what brought me here for the first time. I am a scrap fiend, so I love your Sunday Scraps posts. Congratulations on reaching such a great milestone! Yay - so many followers! I found your blog through someone elses blog - I think it might have been Amys Crafty Shenanigans when she won one of your giveaways! I don't remember how I found your blog, but I enjoy it. I follow your blog through my feedly reader. Umm I've been following you for about a year and I can't remember how I found you! It would be from a link on another blog. Did you schnibble last year? I may have found you through a schnibble parade. Now I follow all your updates, in bloglovin. I've been following you a little less than a year, and I'm not sure how I got here. Was I looking for Narnia? And your Anna Lena zig zag pattern at the top - was that the Anna Lena that used to have a darling shop in Long Beach, Washington? (Or does she still - it's been ages since I've been in the area). Woo Hoo! I am so glad to be a part of your "following"! I think I found you through WiP Wed @ freshly pieced, but I am not certain. I love your blog and congratulations! I thinkI found your block during Bonnie Hunter's easystreet. I can't remember how I found you, but I'm glad I did. Love the inspiration. Thanks for the chance to win! I found your blog through Jeannie and look forward to reading it every morning. I even tried the magic binding tutorial. You are soooooooo inspirational and precise. Laura, I am so glad you tried the binding method! Thanks for being my newest follower! I discovered you last summer in the blog hop (Judy and Plum does that sound right?). And have been following you since. First on my own but more recently I added you thru Bloglovin. I loved the name of your site from the beginning. It is my goal to do that many quilts in a year. I think I am going to have to quit work first. Last year I only made it to 20. Many of them had been hanging around for a while and I finished them up in my goal to complete projects last year. Loooove your Blog too!!! You do Awesome job!! Howdy, Aunt Marti! I took a bot of a break from reading blogs and quilting, and I'm back! :) Hope you are well! To be honest, I am not sure how I found your blog. I've been following you for a while now, but my only guess is that I did a Google search for a quilting technique or something like that, and stumbled upon your blog! I adore your blogs using the Vintage Modern...my favorite fabrics come from Moda, and especially Bonnie & Camille! Great giveaway! I found your blog through other blogs while I was trying to find some new quilt ideas. Hi Marti, I can't remember where I found your blog originally but I've been following for probably 12 months now. I'm thinking that when I first started reading blogs I might have found you through someone else's blog. I'm pretty sure it was the name 52 quilts in 52 weeks that caught my attention, I still don't know how you do it! I follow through Blogger so I'm hoping it still works when Google pulls the plug! Hi Marti, congratulations on 500 followers. I have been following you for some time and found you at a linky party but can't remember which one! I follow through blogger but also Bloglovin so whatever happens with things on 1st July I will still be following. I love both of your WIP. I've just started the chevron quilt. It is such a fun pattern to make. Congratulations, Aunt Marti! I most probably found you through a link on someone else's blog. That's how I found most of the eye candy blogs that I follow. I've been a follower of yours ever since! Hello, Marti. What an inspiring page! I found you through a Pinterest post by Quiltmaker magazine. I expect I will be visiting often! Thanks for the "fiber candy." 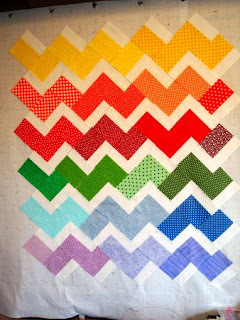 Such a cute chevron quilt! I found you on bloglovin while looking for inspiration! I found you through a pin on Pinterest and have been following your blog via RSS feed ever since. Thanks for sharing your knowledge and giving us inspiration. 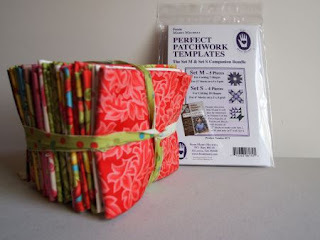 Found your blog through Quilty Pleasures - love, love, Mandarin Grape! I have over 500 four patches left over from a Bonnie Hunter pattern - I was on a roll apparently - and this looks like a great way to use them up. Glad I have this months edition so I've got the pattern; now, where are those four patches??? off to search. I'm not sure how I found your wonderful blog. If was either on a facebook link or pinterest. I now have your blog on my favorite toolbar. I look forward seeing it highlighted when you post something new. I found your blog through the Scrap Squad posts on Quilty Pleasures. And I just figured out how to "follow" someone's blog (duh! )so I am now subscribed to your posts through Yahoo! HELLO! I FOUND YOU READING QUILTY PLEASURES! THANK FOR A GREAT BLOG+GIVEAWAY! Just found your via Quilty Pleasures. I followed the link to your fab bindint tut. Thanks. Just signed up for Bloglovin and started following you and I'm really looking forward to it. Hello again! I found you b/c you tested my block, Summer's End for Quiltmaker's 100 Blocks, Volume 7. Love the gorgeous fabrics, and the chevron quilt, too. Have a super day! Jennifer, I love that block! I'm going to use it as the basis for a sewing machine cover for one of my quilty friend's Christmas prezzies! I found you via Quiltville and through the Quiltmaker website. You are an inspiration! I found your bolg from Sister's Choice. I love her blog and read it every day and will start reading your's too. Thank you so much for showing us so much great information. I discovered you today on Quiltmaker Magazine's Blog. I am going to try the Susie's Magic Binding on my next quilt! I love to discover wonderful and time saving ideas. Thanks for sharing. I saw your Susie's Magic Binding post on Pinterest while I was looking for easier ways to do bindings. I'm in the middle of a t-shirt quilt for myself as I clean out my closet from high school, and a Crown Royal quilt for my mom after she got her first one stolen. So helpful!! I have no idea how I found you! I follow via bloglovin'. Dianne, I'm so glad you found the Susie's Magic Binding tute. Another Aussie friend, I love it! I found you while researching the net for quilt blogs after joining Craftsy's BOM. I'm a happy follower. Trace, I'll *always* be your Aunt Marti! I found you at Quilty Pleasures, and you've been leading me astray ever since. Lead on! Probably on one of my searches for inspiration. You were on another quilter's blogroll and I clicked on you, was immediately intrigued and have been a follower ever since. Maybe about a year now ?~! I do NOt recall whose blogroll it was. What a lovely bundle of fabrics in this giveaway. My friend, Peggy, just brought me a great good bag of her "scraps" that are mostly bigger than fat quarters and may have a few triangles cut out-some gorgeous nature prints and fall colors... I am in heaven where the quilting fabric is free and has already been loved by someone I know. Thanks for this giveaway, Aunt Marti. I follow you every since I found your block a month project a while back. I have gotten tons of ideas from you for my quilts I started making last year when I joined our village Linus group. I've don't 17 quilts for them so far and plan to keep up this new tradition for me. It feels so good thinking about a lonely child holding one of my quilts for comfort and counting the blocks or designs I put in them. The fun never ends. Thank you for this opportunity. Chelra, thanks for sharing your Project Linus reflection. I'm so glad you commented, because it took me to your lovely blog. I love reading about your RV adventures! I just found you today from a comment you made on Plum & June's site. Hi, I'm a new follower, I think I found you through Pinterest I was looking at the tutorial on magic binding, by the way I will try it next week. I found your blog through the QM scrap squad. As a new quilter, you have provided me with much inspiration and new to me techniques. I love your writing style and feel like I have gained a new family member and we would be good friends. When I am ready to retire, I hope I can be as productive as you are. Thanks for the giveaway and congrats on your 500th. I found you through Free Quilt Patterns while searching for ideas. MY CHECKERS REP. GAVE ME YOUR WEB SITE TO GO AND LOOK AT FOR A BINDING TECHNIC. I HAVE NOT FOUND IT BUT I SAW THIS SIGN UP AND JUST HAD TO GO FOR IT. Hello! Hope I'm not too late :-) I found your blog through Scrap Basket Sunday. Congratulations on the 500 milestone! I found you totally by accident. Had time alone at the keyboard, jumping around web sites and there you were. A ready for this challenge. Let the fun begin. I follow you on Pinterest...... also I have a dear friend that recommended you , and I follow each block trying to quilt with you as you go. LOVE LOVE LOVE the site!!!!! !